Home > Uncategorized > Beware of ‘hubbly bubbly’ pipes! HUBBLY bubbly pipes, also known as Hookah or Shisha smoking pipes, have gained in popularity in recent years. Regular and occasional smokers have chanced upon Shisha pipes as offering something a bit different. They are a popular method of smoking in the Middle East and Northern Africa. Shisha pipes are becoming more popular in Europe as something exotic and exciting. New Hookah bars have opened to cater for the trend. People can socialise and share a pipe bubbling with all kinds of flavours, mint, apple etc. That’s not a particular concern. 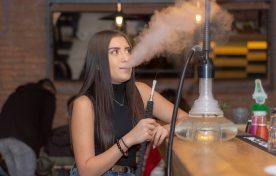 What IS a concern and unknown to most Hookah smokers is that hubbly bubbly pipes carry a real risk of carbon monoxide (CO) poisoning if they’re used in unventilated, closed-off rooms. The smouldering charcoal used to fire the pipe releases poisonous CO. It’s an invisible, odourless and deadly gas. Smouldering charcoal can give off a lot of CO. Carbon monoxide stops haemoglobin in your blood from carrying oxygen. That causes problems with internal organs. Mild or chronic CO poisoning symptoms include cold or flu-like symptoms, headaches, problems with abnormal tiredness. But CO it is a very strange toxin and many other symptoms are possible. Sascha Meding, Vice Chairman of the Guild of Master Chimney Sweeps, said: “Members of the Guild are 100 per cent focused on keeping all our customers safe from carbon monoxide poisoning. Sweeping chimneys on a regular basis keeps everybody safer. We also raise a red flag if we become aware of any other dangers of CO.